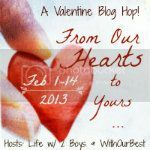 Welcome to the 2nd annual From Our Hearts to Yours Valentine’s Day Giveaway Hop hosted by Life With Two Boys and With Our Best. Each blog participating has a prize of at least $25 worth of Valentine-related items so after you have entered my giveaway, I encourage you to hop along and see what the other bloggers are giving away too! 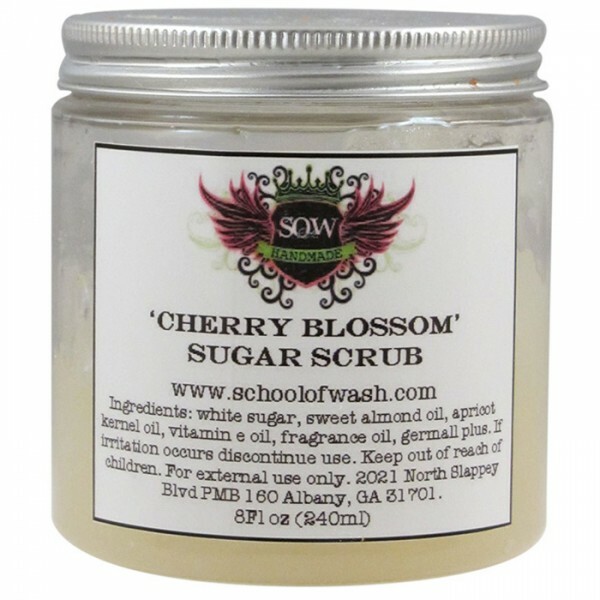 With over 245 scents to choose from, School of Wash has a scent for everyone! Custom designed for you to suit your scented interests! No need to visit a fancy pants bath product store when you can sit at your computer and have a wonderful line up like School of Wash! 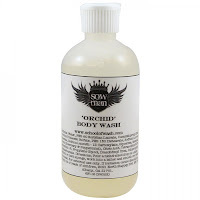 Products for Men, Women, Kids and even pets.. Don't let Valentine's Day slip you by this year, get original with School of Wash designed handmade products for your sweetie. What about the smallest sweeties! 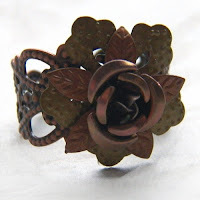 "Don’t forget that special friend, daughter, son, niece, nephew or grandchild this Valentine’s Day! 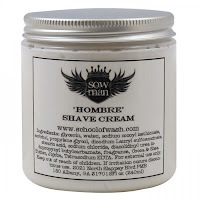 Give the gift of School of Wash™ handmade bath products. Pick your favorite products to include in your gift pack, and your little cupid will receive their products wrapped in a special Valentine’s bag with a personalized “Max the Superdog” Valentine Card! Each set will include pre-determined scent selections (scents are determined by recipients gender), these selections may include: Candy Cream, Candy Crush, Candy Frosting, Chocolate, Cupcake, Love Spell, Pink Candy, Pink Sugar Cookies, Rose Garden, Strawberry Frosting, Sugar Bubbles, Sugar Cookie, Sugar Rush, Sweet Tarts or Sweet Treat. *Due to demand, our Valentine’s Gift Packs include a handling time of 4-6 days." My kids actually get more excitement out of Valentine's Day than my Hubby does. I love to spoil them with love on this special day. 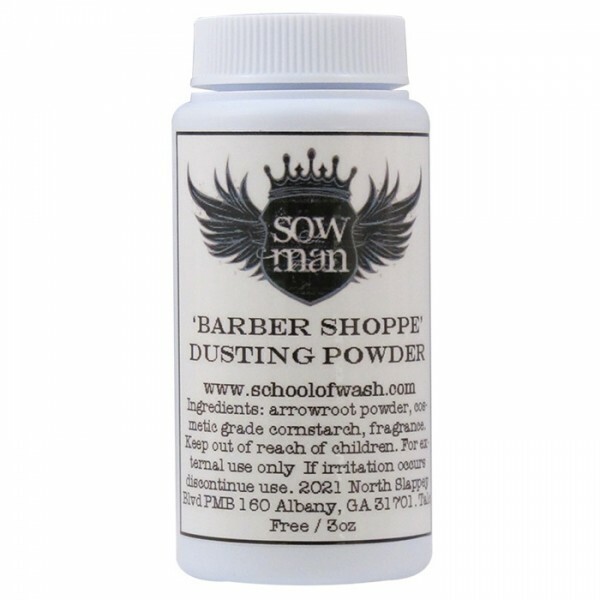 School of Wash spoiled them with not only review products for me, but for each of my children. I was so amazed and blessed!! What a blessing to have a gift for each of my 6 children and myself from a sponsor! 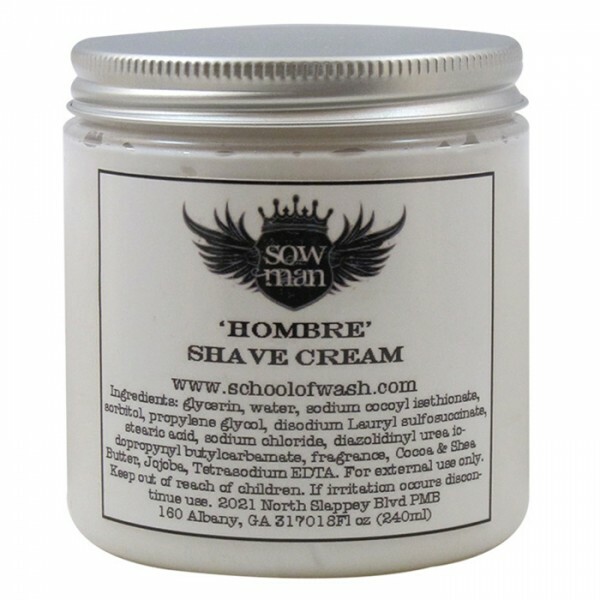 My Teen Shavers each received Hombre Shave Cream and Barber Shoppe Dusting Powder. No more borrowing Dad's Shaving Cream, they have their own and it smells so manly! My middle boys each were able to try the Body Wash and Body Lotion for Men. My 13 year old had me feel his arms and face after he washed, they were so smooth and soft! I think they are loving having their own body wash and lotion that isn't Mom-like! School of Wash has a Kids Line, like the one you are entering to win! Super kid scented products like this Body Wash, Handmade Body Lotion and Flavored Lipbalm. Whipped Pumice Foot Scrub, Whipped Sugar Scrub, Lotion Bar and a lipbalm were in my gift bag. Felt like I had a best friend!! 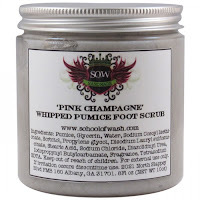 The footscrub is divine, mine are rough and coarse and this was gentle and relaxing to use on my piggie toes! 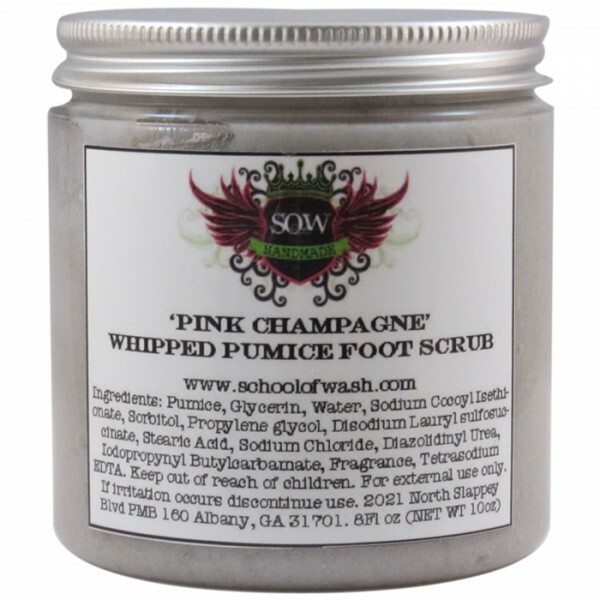 I tried the Pink Champagne like in the photo and it smelled wonderful. I was able to try the Blue Candy Sugar Scrub and I loved this scent as well. A sweet but not over powering sugar candy scent. 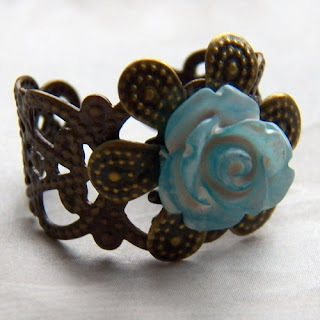 I absolutely love Lotion Bars and have made them in the past. They are a MUST this time of the year. School of Wash bars are fantastic, and come in a container you can slip in your purse for your dry hand needs throughout the day! 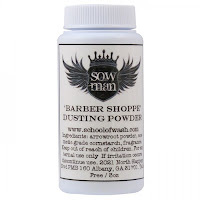 I have just begun to touch on some of the products that School of Wash has! There are so many choices, and the scent choices is huge for each one!! I am looking to get some body butter next time I need a lotion. I suspect that is just as wonderful as the other products our family has been able to try out this week. You can enter to win Little Cupid Valentine Pack for a Girl or Boy! Send Valentine's flowers this holiday!! 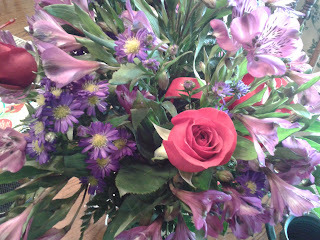 Who doesn't love the beauty of flowers, especially in Feb when it is still cold and blah outside! This gorgeous arrangement with brighten anyone's spirit and home! 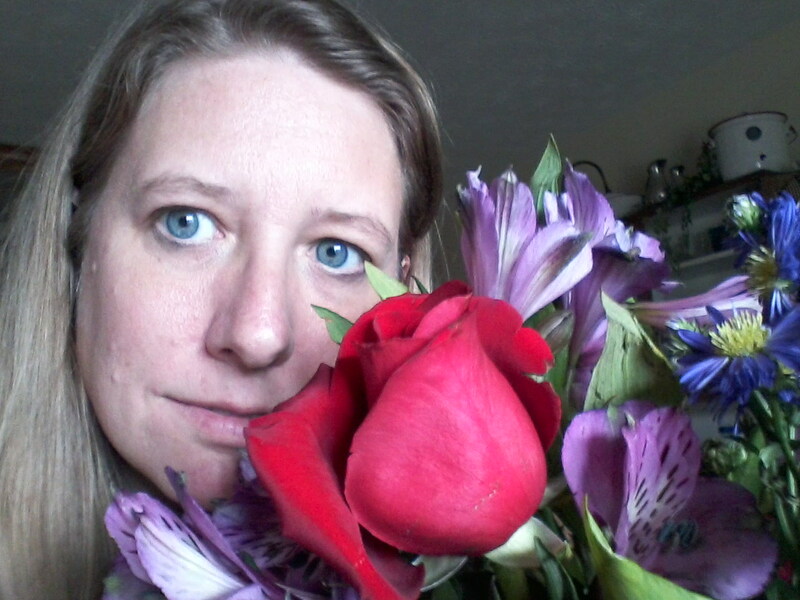 I loved how the florist called first to make sure I was going to be home, especially in this cool snap we are having. She verified the address and told me she would be here in 1/2 hour. Perfect timing, didn't even have to get out of my pajamas! She drove up, brought them to the door right from the van and the fragrance hit as soon as I brought them in the house. What a rosy bunch of flowers, and it is definitely improving my mood for the day! Roses smell so good! Now the stock photo does show like 8 roses, this particular arrangement had 3. Not sure if that is specific to each florist or not. 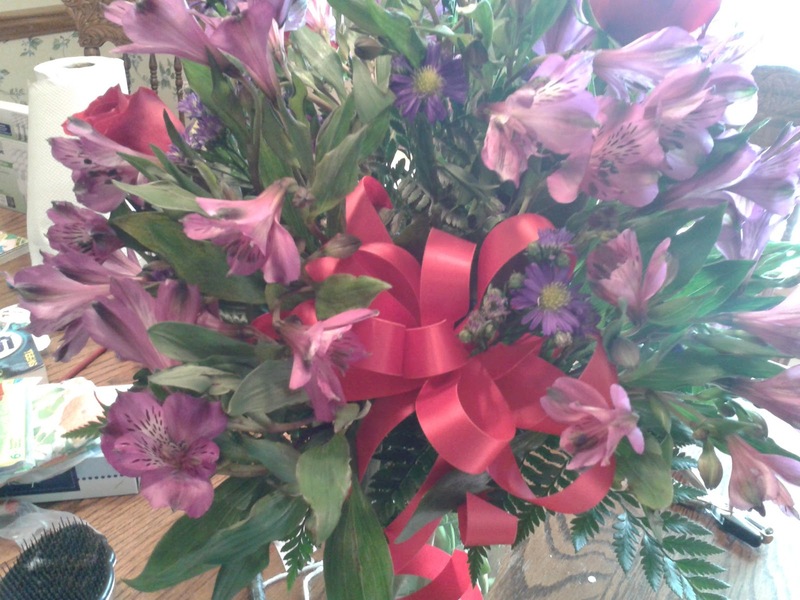 Will see what I can find out from others who reviewed this beautiful arrangement. This is a perfect arrangement for your Valentine Sweetie! Colorful with purples and red. 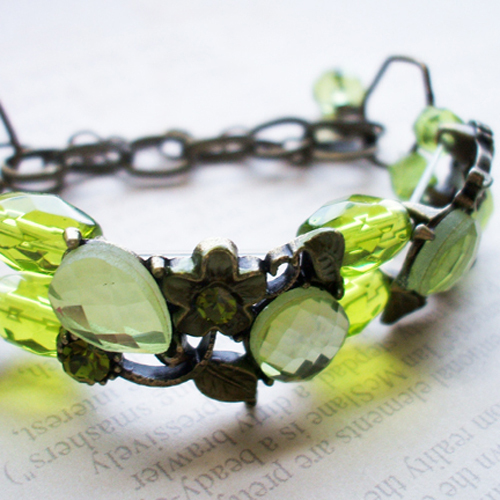 It comes in a clear glass vase that you can reuse again and again. It is actually quite a heavy arrangement! The flowers are fresh and smell divine! 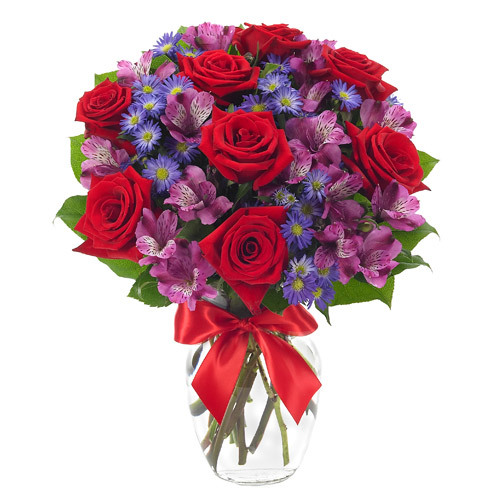 All My Rosy Love Bouquet is hand arranged by a local florist in the USA with fresh, seasonal flowers including red roses, purple alstroemeria and purple monte casino. 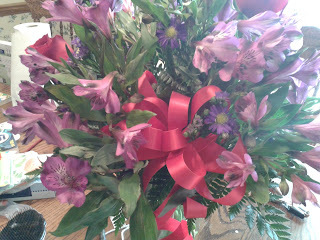 With a glass vase, decorative ribbon and personalized card message...this flower bouquet will wow anyone's Valentine. 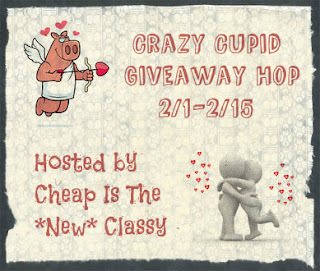 Crazy Cupid is out and about wishing our readers a Happy Valentine's Day! Thanks to Cheap is the *New* Classy for hosting this event. 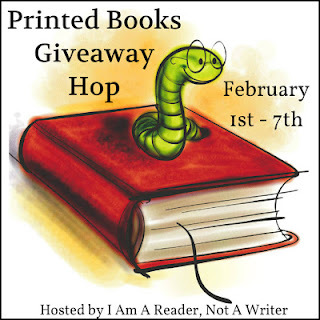 Be sure to stop by the other blogs after you enter my fantastic giveaway! Fenno Fashion is our sponsor for this Event!! I absolutely LOVE vintage style jewelry! 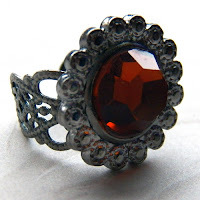 Browsing estate sales, I am always drawn to the vintage style jewelry. Loud bling just isn't my style. I was enthralled and in love when Megan sent me this set by FENNOFashion. Firstly I love how the necklace and the earrings go so wonderfully together! 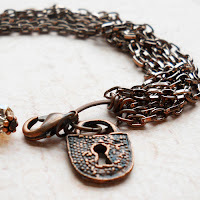 I have gotten numerous complements on the necklace from wearing it out and about. It is seriously one of my favorites and works perfectly with a V neck style shirt. 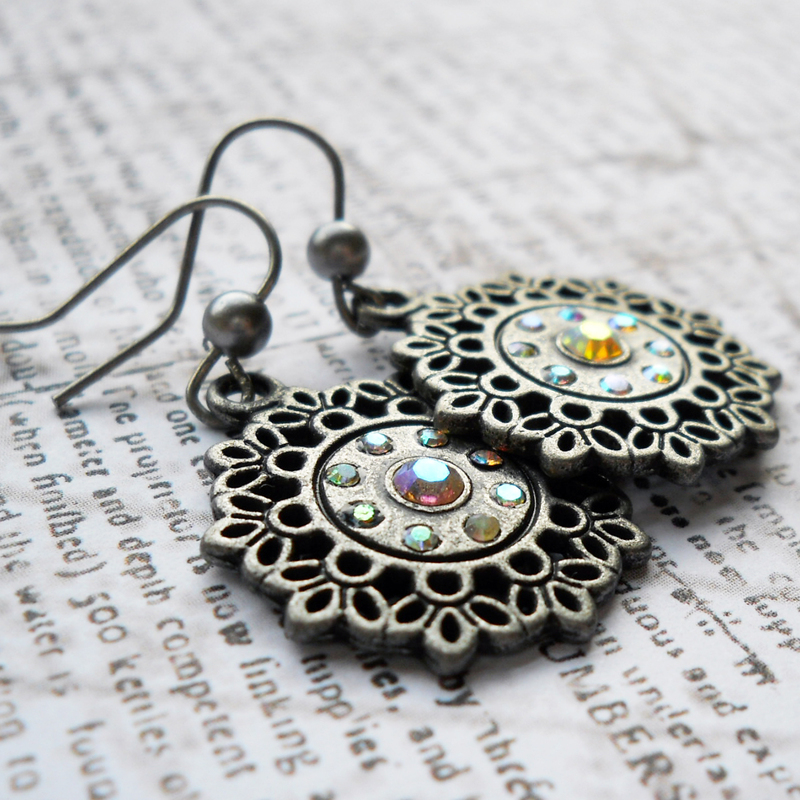 Love these delicate earrings that radiate beauty. 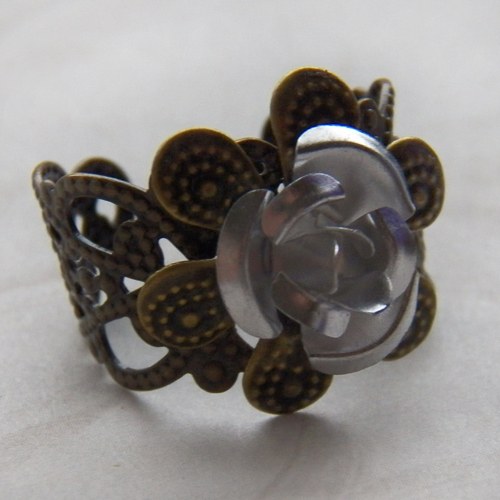 The clasps are unique and so easy to use! 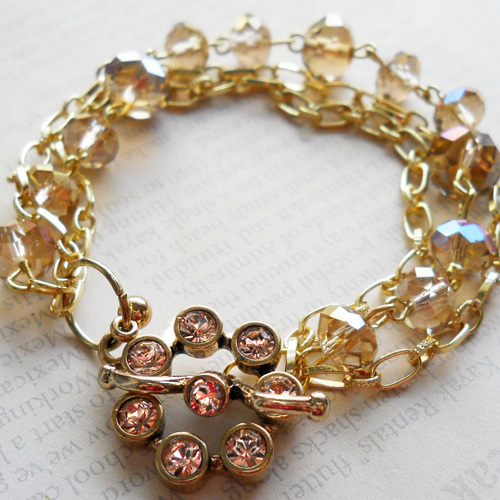 Just a gentle dangle, but when the light catches the crystals they sparkle so nicely. 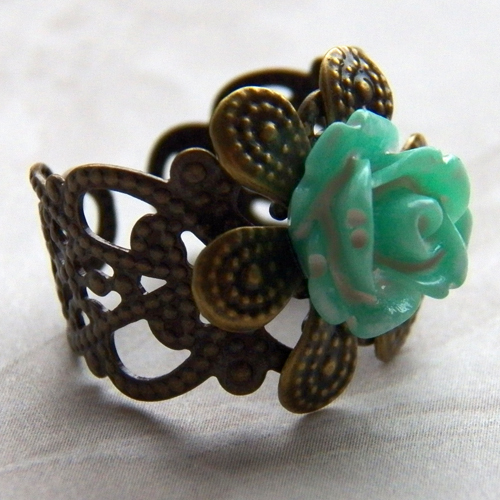 With the antiquated look they give an aura of nostalgia. Check out some of the beautiful jewelry I have drooled over on Megan's website!! 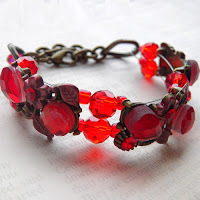 "FENNOfashion is an online boutique filled with handcrafted vintage inspired accessories. 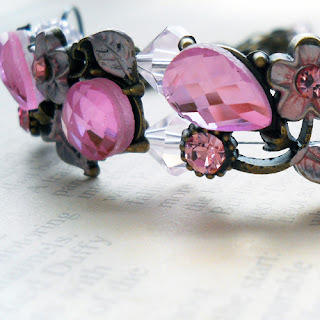 The mission of FENNOfashion is to not only create trendy vintage inspired accessories, but to be an active part of the community by participating in fundraisers, donating to those in need and raising awareness for different causes. With a passion to create beautiful things along with her love for fashion and accessories, Megan attended The Savannah College of Art & Design, where she earned her bachelor of fine arts degree, specializing in fashion & accessory design. Growing up in Cincinnati, Ohio, Megan also lived in Tallahassee, Florida, Savannah, Georgia and Austin, Texas (where FENNOfashion was launched) before finally deciding it was time to move back to her hometown of Cincinnati August 2009. 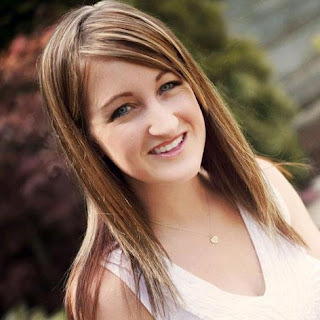 Also Megan is Senior Fashion Editor for WKRQ & CincySavers.com and a new mom!" I am offering a Cozy Mystery, a newer genre that I am really enjoying! A Golden Valentine Sampler Free Download!! 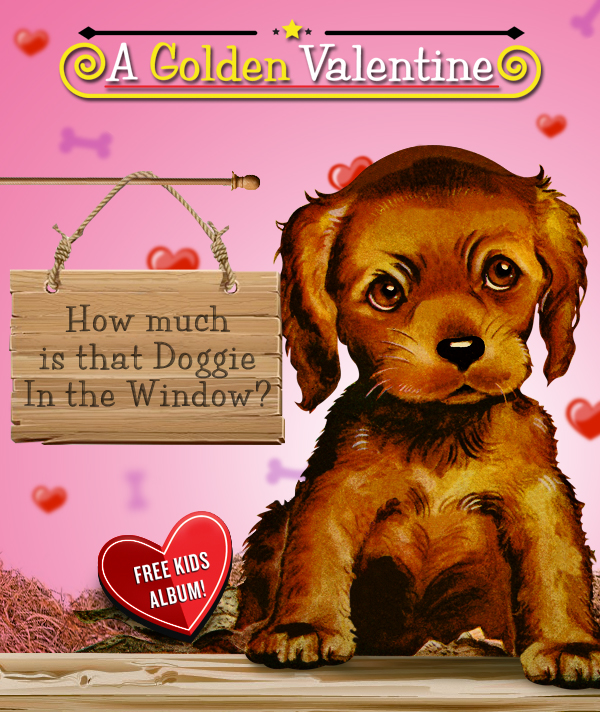 Ever notice how there's not a lot of options for kids music on Valentine's Day? Well, we're happy to announce that as of today Golden Records offers a free sampler download for you! "A Golden Valentine" is a collection of 10 handpicked songs for children, including 3 bonus celebrity performances. 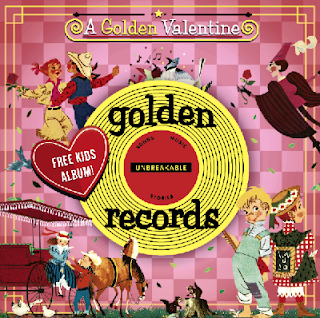 The Golden Records collection recaptures the nostalgic music of yesteryear, creating a collection of beloved instant classics for families to enjoy together. The album is available for free download on both the Golden Records website here: http://bit.ly/Qt3A39 and the Golden Records Facebook page here: http://on.fb.me/Xj6Dhn. This photographic journal takes us behind the scenes in the day of a wildlife rehabilitator. Rehabilitators feed and care for orphaned, sick, or injured wildlife. 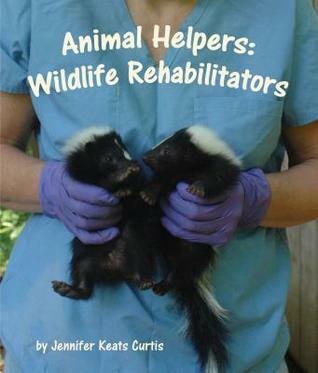 They also teach people about the rescued animals at wildlife centers. Teaching them about the specific animal as well as what to do if they find a hurt animal in the wild. The desire is to return the animal to it's native environment. The photos in this book are just gorgeous, from owls, opossums, birds, fawn and more. This is a fantastic book for young people to explore wildlife and careers associated with them. Geared for preschool to third grade. Very easy reading, but informational as well. The back of the book contains a section on Creative Minds: Compare and Contrast vets and rehabilitators. They also have some great true and false questions to get the reader thinking more deeply. 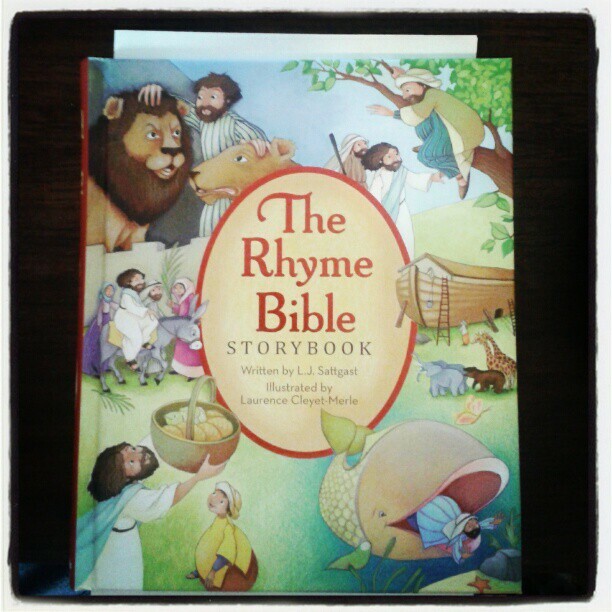 From 'A New World' to 'Good News', the Rhyme Bible takes the word of God and simplifies it in a rhyming way for children to hear and remember. 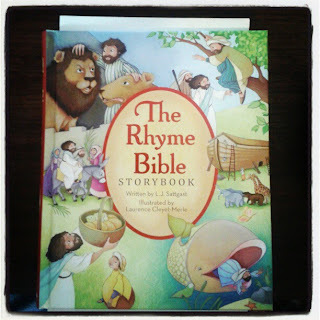 35 classic Bible stories are brought to life through beautiful illustrations and a rhythmic reading that stays with them long after the book is closed. Perfect bedtime devotional, or to begin your day in the Word. 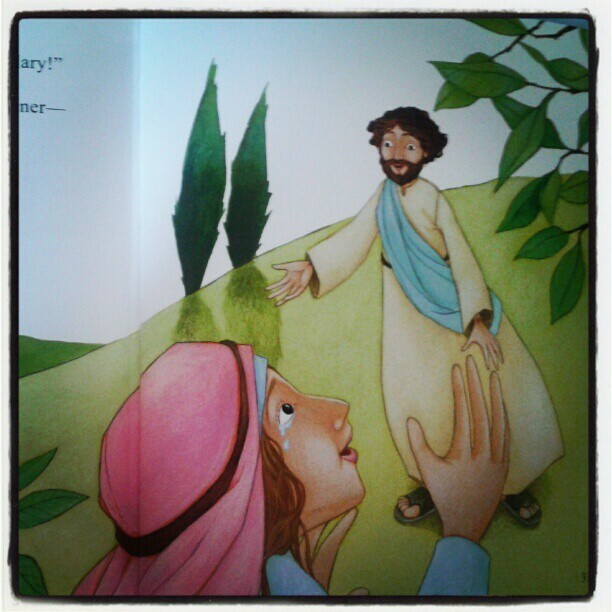 Great for preschoolers who still enjoy sitting on Mom and Dad's lap for stories. to take our sins away! I love how this Bible incorporated stories from old and new testament and continues with the resurrection of Christ, ending with the hope of his return for his children one day. 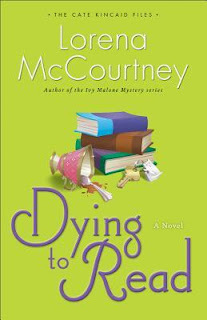 I received a copy of this book in exchange for an honest review. All opinions expressed are solely my own.